I Don't Know - An Ozzy Tribute? available for Corporate Events, clubs, fundraisers and parties. I Don't Know - An Ozzy Tribute? I Don't Know - An Ozzy Tribute? was formed early 2016 with the intentions to create an Ozzy Tribute like no other. The main goal is to recreate the best Ozzy Tribute show that also payed tribute to the legendary Randy Rhoads. With the intentions clear and their expectations set high I Don't Know began it's journey to deliver the most accurate live performance of Ozzy Osbourne during the Blizzard of Ozz and Diary of a Madman, the Randy Rhoads era. 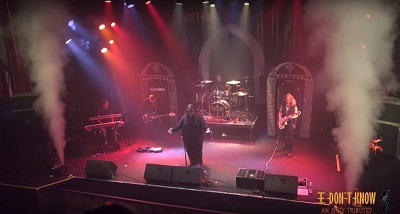 After playing well known venues in New York, New Jersey and Connecticut from the start of 2017, I Don't Know reminded the area what it was like to be back at an Ozzy Osbourne concert in 1982. Growing fast, they built up their stage show with a massive backdrop, stage props, fog machines, smoke cannons, and most importantly a bat that "Ozzy" could bit the head off of. I Don't Know is constantly growing to ensure that they are the ultimate Randy Rhoads era Ozzy tribute in New York.